At this time of year, there is a veritable sleigh-load of cheery Christmas kids’ books circulating the stores. Some witty and nuttier than fruitcake. Some suffused in meaning and wonder. Others, supreme tales destined to be classics. The Girl Who Saved Christmas is all these and more. If you are ever in need of a little magic, if you ever find yourself questioning reason, if your festive spirit is ever waning, hope can be found with Matt Haig. This is invigorating storytelling for midgrade readers all the way through to 99-year-olds. Following on from Haig and Mould’s first collaboration, A Boy Called Christmas, this tale works so well at suspending belief and infusing hope, you’d be forgiven for feeling you’ve already met Father Christmas. Maybe you have. Haig takes what we have already been led to believe and crystallizes it into one big fat tangible beautiful believable Christmas miracle. Of course, it’s easy to believe if you really want to. For those who can’t or have had their beliefs challenged, like Amelia, accepting magic is a little harder. But not, as it turns out, impossible. On the eve of Christmas, the North Pole receives a violent shake up. The Trolls are on the rampage again after years of mutual truce between them and the elves. Father Christmas is blithely undaunted by the threat to Elfhelm and sets out to deliver his load of love and gifts, business as normal. A severe lack of magic hampers his efforts, however, which results in reindeers literally dropping out of the sky. Christmas is in serious jeopardy and not even the ever-buoyant Father Christmas can chuckle his way out of it. 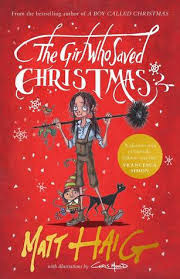 Only one wily orphaned girl, Amelia, can reinstate Father Christmas’s power, save his reputation and set things right with the Trolls, but to do so, she must regain her hope and belief in magic and that’s not easy when you are virtually imprisoned by the wicked orphan-keeper, Mr Creeper. With cameo appearances by Queen Victoria and Charles Dickens, this tale is saturated in the spirit of Christmas. Mould’s illustrations enhance an already magical tale with strokes of Dickenson brilliance. I love everything about this book just as I did its predecessor, A Boy Called Christmas; the joy, the spirit, the illustrations right down to the sparkly snowy bits on the cover. A higher than highly recommended Christmas must read, even if you miss getting it under the tree this year, be sure to pop it on your list for next Christmas. Sublime to read aloud to little people or to cherish alone as you would the last fruit mince pie. 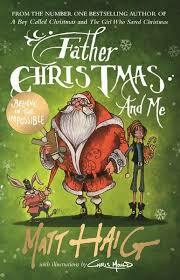 Read, A Boy Called Christmas first to truly fortify your Christmas spirit, then follow it with Father Christmas and Me.